I had just met up with a good friend at the mall and we said our goodbyes at the bus stop. I knew I had about a 30-minute commute ahead and didn't want to be so late going home. I boarded the bus and was happy that there were a lot of open seats for me to choose from. I walked towards a completely empty row and slid towards the window. I loved window seats. Not long after, at the next stop, a few more passengers boarded and as I looked up, an older man stood by the empty seat to my left and smiled at me. I politely smiled back as he took his seat beside me. I was glad it was an older man, someone who looked decent, dressed fairly well and didn't look like anyone who would mug me. Heck, he could be my father, although I could tell he was probably at least 5 years older than my dad. It didn't take long for the man to start making small talk with me, only his idea of small talk was undeniably making me feel uneasy. He asked where I worked, what I did. He asked where I was going, where I lived. I don't remember if it was the mere conversation that made me feel uncomfortable, his tone, or if it was the way he was looking at me. He was smiling, he looked harmless, gentle and had a fatherly air about him. And yet somehow I found his hand on mine and even took the liberty of stroking it. He said he immediately noticed me when he boarded the bus and couldn't help thinking how beautiful I was. He said I had the face and smile of an angel. The fatherly and safe feeling didn't linger much too long. It dissipated as soon as I felt his unwelcome hand on my arm as he started to tell me that he's a widower and wants to have his secretary call me for him sometime. 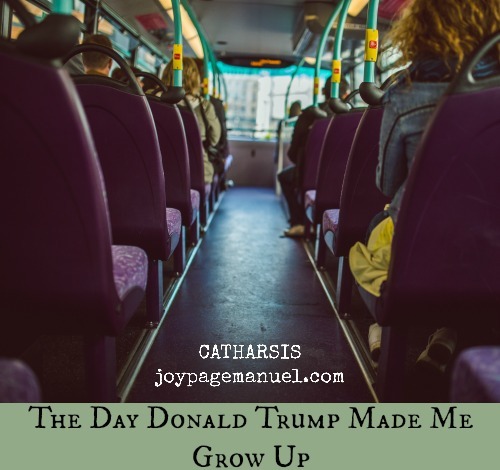 He made it a point to tell me he was wealthy, although I wanted to tell him at that point, "Yes and I'm smart too and am wondering why a rich guy like you takes this sort of public transportation". He asked if I had a boyfriend and instinctively I said yes even though it was a lie. I wanted to make it clear I was not interested and that at that moment all I was praying for was to be ejected from my seat. My stop just couldn't come quick enough. Eventually it did and I must have left so fast, so awkwardly that I honestly don't remember how I made it to the bus exit from my window seat. This happened to me 20 years ago in the Philippines. I was in my early 20's and thought I knew everything I needed to know. My parents made it a point to teach me and my siblings to be always aware of our surroundings. We were taught to keep a close eye on our belongings so that we can avoid getting pickpocketed. What I was not prepared for was how to deal with creeps and potential sexual predators. All week long, the breaking news was that of a presidential candidate bragging about sexual assault. This person wants to be the most powerful leader in the world and yet does not have any shred of decency in his being and shows not a hint of a firm moral compass. He sexualizes females every chance he gets and believes he is entitled to them just because of who he is. It is beyond sickening. The memory of this nightmarish bus ride surfaced as I listened to this candidate flaunt his disgusting behavior and belief that he can always get away with most anything, including the putrid words that come out of his mouth as he objectifies women. I don't enjoy remembering what happened to me, let alone speak of it, but it must be done. Things like these need to be brought out. Perhaps there is value in taking these memories out of the shadows no matter how shameful or even painful they might be. What happened to me is but a small fraction of other assaults and abuses experienced by other women but it doesn't make the sense of violation and the shame in feeling that I should have acted differently any less intense, any less life-altering. You see, what I realized with my experience was that I was taught a lot of things and mostly it had to do with being 'nice', being 'ladylike'. I was taught to be friendly, to be polite, to be respectful especially of older people. That man on the bus was an older man. I thought I needed to be respectful. I thought I needed to remain nice. I thought I was not supposed to make a scene. I thought I needed to smile and still speak politely even though I wanted to scream, say 'STOP' or just be honest and admit that it was making me uncomfortable and that none of it was okay. I was not equipped. The definition of the situation, the character involved, the impression I was given, coupled with the socialization I received as to what it meant to be 'proper' all confused me. I just didn't know better. That woman in her 20s drowned in a sense of helplessness. But not anymore. This one in her 40s knows better. This one in her 40s can now parent her own child and teach the intricacies of what it means to value others without ever sacrificing one's self; to handle with grace the delicate balance between propriety and self-assertion. This one can and will speak up for herself. This one can and will draw clearer boundaries, will refuse unwanted and unsolicited attention, and will fight back. This one now believes there is no shame in defending oneself, no shame in appearing and sounding rude to someone, anyone, who doesn't know how to respect other people, especially females. I will definitely speak up. I may no longer have my day with that man on the bus but I'm sure I can still have my voice heard. And I want to make sure that voice is echoed by the vote I will cast next month. It is a voice that can't be drowned out as it fights back against indecency, a disgusting sense of entitlement and misogyny. It is never too late for me, or any of us, to be heard. Sadly, I think almost all of us have had an encounter with a Trump-esque type man. I know I've had my fair share, mostly in my 20's and like you, I was raised to be polite. Which is why I have chosen to raise my daughters with the thought that they don't owe anything to a stranger that makes them feel strange. That's good advice, Marie. I hope they heed it. Let's hope women speaking out, standing up for themselves and saying that's not okay will be the end of Trump.